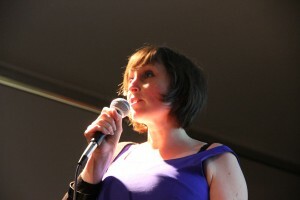 Becky Cherriman is a commissioned writer, creative writing facilitator and prize-winning performer based in Leeds. Her work is informed by the belief that not only do writing and the spoken word help us to make sense of the world and our place in it but they provide us with the tools to transform our lives. For the last fourteen years, her main occupation has been leading workshops with various community groups and schools – a role she loves. She works regularly for a number of key organisations and charities including facilitating Ilkley Young Writers and Bradford Young Writers alongside poet and performer Michelle Scally Clarke for the Ilkley Literature Festival. Her writing has been published by Bloodaxe, Seren, Valley Press, Mslexia, New Walk, Envoi, Mother’s Milk; in Poets For Corbyn, on umbrellas and on the walls of a recording studio. She has had pieces commissioned by The Hepworth Wakefield, The Rotunda Museum, Humbermouth Literature Festival, Imove, Grassington Festival and most recently by Beam for Altofts Festival In A Day. In 2015, her poem ‘Austerity’ was translated into Italian by Francesca Spinelli and printed in the socialist magazine Internazionale. Becky’s poem ‘Jesus Lives’ was highly commended for the Forward Prizes 2018 and she has won first prize for The Speakeasy Open, second prize in the Ilkley Literature Open Mic and runner up in the Yorkshire Open. Her work has been shortlisted in several international competitions including The Fish Short Story Prize. In 2013 she was the commissioned poet for Morley Literature Festival and Grassington Festival. Becky’s poetry pamphlet Echolocation was published by Mother’s Milk Books in February 2016. Her first collection Empires of Clay was released by Cinnamon Press in November 2016. She is currently working on Corseted – a one act show that weaves together the story of women’s rights campaigner Alice Cliff Scatcherd (1842-1906) with the testimonies of refugee women living in the UK. The research and development phase, which took place last winter was funded by the Arts Council and Leeds Inspired. A current collaboration is Haunt, an Imove commission, working with Steve Toase and people experiencing homelessness or vulnerable housing. It includes material from her, as yet, unpublished first novel. She has recently completed another draft of her second novel. Approaches from agents are welcomed.